Several years ago, the spectacular 4-1/2′ high by 8-1/2′ wide hostas on either side of the walk between our house and the public sidewalk weren’t there: the lawn was uninterrupted on our entire corner. 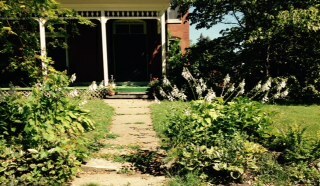 The hostas lived next door, on the shady east side of the beautiful little front porch of our neighbors. My dear friend there had planted a lush garden beside that sheltered nook her family often enjoyed. But the hostas got too happy there, and grew, and grew, and GREW. They crowded each other and everything else planted in that flower bed. The holly bush appeared to be appealing for help! She decided they had to go, and asked me if I wanted them. I didn’t even have to think about it. YES! I love large, exuberant plants! I had no idea where the hostas would go, so we planted them beside our carriage house/barn, and they survived the hours of sunshine they received there every day, but they didn’t thrive. Leaves crinkled and turned brown before summer was half over. So finally, I decided that the beautiful, shady sidewalk intersection under the century-old maple trees out front would become a pair of corner shade gardens. My husband dug up the plants and dug the new holes and helped me move the hostas; and I added hydrangeas, columbines, colorful little shrubs, ajuga for ground cover, and other smaller varieties of hostas. I loved it, and everything there thrived. Then, on July 13, 2015, the unprecedented windstorm that decimated our city and its trees felled the maple tree that had sheltered the hostas and the plants that shared their corners. I have watched for five weeks as the giant hostas have begun to crinkle and turn brown. I water them–oh, okay, I have probably have even talked to them on occasion, but they don’t have it in them to tolerate as much direct sun as they get now, without the shelter and shade of that beautiful old maple tree, conversation or not. So I’ve begun a large shade garden under the dogwood tree that stands between our house and our neighbor’s. I plan to divide and move, or transplant, the hostas into the shade that in the best place for them to live. If I don’t intercede, I don’t think they will survive a full summer of direct sun. Remember when Jesus challenged us to appreciate how lilies are clothed, and how birds are fed, and apply that to our own contexts? I think we’re a lot like my giant hostas, too. Like them, we do best in the optimum surroundings, don’t we? We might enjoy crowding in the context of peaceful collaboration, and just spread out and enhance or overcome everything else in the environment. We might be isolated and have too much focus on us to be comfortable in another place, but do our best anyway. Then we might be relieved to subsequently find ourselves occupying a spot in which we can participate with others in a non-threatening context, and thrive. We might accept being moved to a different location, and enjoy being the biggest “thing” in the space; then the context of that location changes, and we struggle along, trying to make the best of it, looking and feeling less than enthusiastic, while the less conspicuous ones around us adjust and do well. We might put up with a little more direct (spot/sun)light than our comfort zones will accommodate for as long as we possibly can, because we’re used to where we are, and see no way to change; but eventually, we have to accept that if we get moved yet again, it will be out of our control, but for our own good. We can thrive again. I hope I can trust like the lilies for how I will be clothed, and like the birds for how I will be fed, and like the hostas for context in which I will thrive. How about you? How difficult is it for you to happily “find a new place to bloom”? This entry was posted in Blog and tagged context on August 20, 2015 by lrmayfield. Life roles provide contexts about which we often have little input at all, and they don’t occur on the schedules we would choose. Sometimes we have to wait, and we only get to choose how we will respond. One of the great joys of my life is being a grandmother, and one of the great things about being a grandmother is that it is a value-added role. First a wife, then a mother, then a grandmother–each added on to the other, but waiting was involved at each step. Having each baby required at least nine months of waiting, followed by a few hours of frantic activity; and when our kids started having babies, we eagerly waited for that phone call indicating we needed to finish packing the car and head for another state. Once, we got from Illinois to Michigan in time to spend several hours in the family waiting room waiting for the announcement that the baby had been born. For another, I had made plane reservations to be in California for two weeks to be present for the arrival; but my time there came and went, and we were still waiting for that baby. I had to fly home and let the next family member in the relay arrive. For still another grandchild’s birth, we drove from Illinois to Georgia the day before the scheduled big moment to stay with the older kids, but that baby had arrived, in the car, in the hospital parking lot, about five minutes before we got there! We don’t always accurately guess how long we’re going to wait. But none of that was or is really significant waiting, in the great scheme of life. I follow a young mother on Facebook whose little boy is fighting advanced cancer, undergoing unbelievably painful and exhausting treatments. She is praying for his healing, and waiting, and thousands are joining her. That is some very serious waiting! This summer my husband and I had the opportunity to have seven of our young grandchildren visit our home, in fluctuating groups, for several weeks (hence, a delay in blog posts!). One sibling group of four was to stay with us without their parents for a few days. The first night after they were left with Grammie and Grandpa, one had a physical and emotional meltdown, wanting Mommy. I could only explain that their mother would return for them in a mere three days, but logic didn’t help, and it wasn’t a time for discipline. Our grandchild was devastated with loss, and at that moment had no willingness to wait at all. All I could do was hurt with that precious child, and pray, and wait for the pain to ease. The only way to learn to wait is to wait. The second day I prayed all day that the scene wouldn’t be repeated that night, and that was the day I read Jennifer Rothschild’s story lesson in my Bible study workbook. Jennifer, a gifted singer, composer, pianist, and Bible teacher, lost her sight at 15, and has been praying and waiting for 30 years that it will be restored. That evening, before bedtime, I gathered the children and told them all about Jennifer waiting for 30 years, to see again. I asked if they knew anyone who had waited a long time. The oldest quickly volunteered that Hannah waited for baby Samuel for a long time, then gave him back to God. We also recalled Sarah and Abraham waiting decades for Isaac. Then I reminded them that the reason God gave us those records was not just so we could memorize the stories, but so we could use them in our own lives. So we compared those women’s years of waiting to waiting only two more days for their mother to return. Suddenly it seemed manageable, with God’s help, even to the one who was missing Mommy so much. We prayed together, and they all went right to sleep. That grandchild couldn’t experientially comprehend Hannah’s years of waiting for Samuel, Jennifer waiting 30 years for sight, or Sarah waiting more than twice that long for Isaac; but within the NOW context of waiting for Mommy, it became clear that sometimes God allows us to wait so that He can show us that He can get us through it, and He will answer our prayers, in His time. Hannah didn’t even know if her waiting would end with what she wanted, and Jennifer is still waiting! Our grandchildren’s mom definitely planned to be back in time for lunch in two days. In the meantime, those urban children got to play in the creek, ride behind Grandpa’s tractor, catch frogs, collect rocks, and eat goodies only Grammies can get away with providing. Put in its true context, the wait became not only manageable, but special. That experience expanded my understandings within my own context, too. Waiting is part of the Plan. Waiting can be a faith-builder. Others are impacted, directly or indirectly, by how I choose to wait. God’s Word gives me models and promises that can demonstrate the purposes of waiting, and I can grow stronger from remembering their choices as well as making my own. This entry was posted in Uncategorized on August 18, 2015 by lrmayfield.